Fay Anderson receives funding from an Australian Research Council Linkage Grant in partnership with the National Library of Australia and the Walkley Foundation. You may have noticed we recently marked the centenary of Anzac. One hundred years after Gallipoli, we are seeing photographs of telegenic young men in their pristine uniforms illustrating media and marketing opportunities. Or in the case of Zoo Magazine, a young woman in a white bikini holding a poppy. The appropriation of war photography is not new. But what is striking is the imagery used to commemorate the first world war and the way it has been subsequently used to justify contemporary military commitments. The pictorial selectivity has its antecedents in 1915. First world war photographers fell into two main categories: amateur and official. Reflecting the astonishing naivety about the war and presumably its anticipated brevity, Australian soldiers were each given a Vest Pocket Kodak on the voyage to Egypt to document their exploits. The cameras were quickly confiscated when the adventure spiralled into a bloodbath. Australia accredited only three official war photographers: Herbert Baldwin in 1916, a British photographer, who lasted barely six months before being discharged due to ill health (a common euphemism for “shell shock”) and Australian photographers, Frank Hurley and Hubert Wilkins. 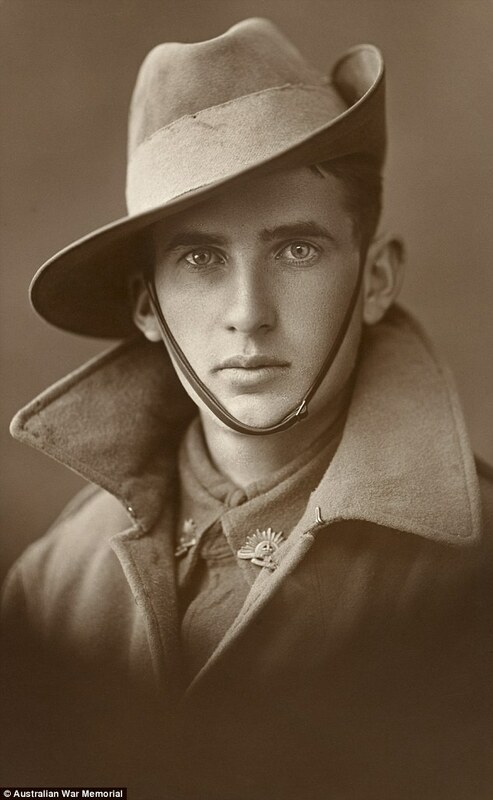 Though both Hurley and Wilkins produced an outstanding body of work, photos of Australians in combat never appeared in newspapers during the war. Published photographs were restricted to staged images of soldiers on training exercises, soldiers as tourists in Egypt, departing for, or arriving at various destinations, or portraits of the young men who died accompanied by captions including mandatory references to heroes, sacrifice, the fallen, the defence of freedom and Empire. In contrast, it was the unpublished photographs, which provide a vivid tableau of unseen military life. Some captured the enormity of the battle, the nightmarish conditions, the bleak and ravaged landscape, and the Australian dead, dying, maimed and emotionally fragile. Other photos document some of the 1,300 Indigenous Australians who fought in the war. But the sepia brochure “celebrating 100 years of ANZAC spirit” issued by some Federal Ministers, and Woolworth’s much derided “Fresh in our memories” campaign featured the same photograph of a young soldier. Known unofficially by the War Memorial as the “handsome man”, we don’t know his name or for that matter his fate. It does not matter: he was selected because he serves an important purpose; the representation of conventional and comforting ideas of Anzac valour and sacrifice. One of the few images of a wounded Australian that has been used in the commemorative media coverage was taken by Ernest Brookes, a British official photographer. ‘An Australian bringing in a wounded comrade to hospital. Notwithstanding the unhappy situation, they joked as they made their way down from the front. In the distance can be seen North Beach, running towards Suvla.’ Australian War Memorial/Brooks, Ernest (Photographer), 1915. The photograph is acceptable because the soldier is smiling but the media, including well regarded newspapers who use this image, ignore or have removed its dubious provenance. Some have sourced it from Getty images who do not always fully caption photographs. The Official Australian War Correspondent, Charles Bean, noted that Brookes’ photograph had been “re-enacted”. Taken by an Australian official photographer, it shows wounded and exhausted soldiers being treated at an advanced dressing station near Ypres. Not all the soldiers are identified; we do not know what happened to the damaged young man featured in the centre of the image, his condition sometimes attributed to shellshock. There are also photographs of the dead. One showed dead and wounded Australians and Germans during the battle of Passchendaele, in October 1917 . You won’t see images like these in the current memorialisation of Anzac. I’m not advocating the use of gratuitously violent photos but we should consider ones that enrich our understanding of the diverse experiences of war. It is time that we widened our visual ideas of courage rather than censored suffering. Sanitised imagery obscures our understanding of war and trauma. As historian Marina Larsson reminds us, there are no reliable statistics to indicate how many returned soldiers suffered from mental disorders. Of the 416,809 Australians who enlisted in the first world war, more than 60,000 were killed and about 156,000 were physically or psychologically wounded, in addition to 700 reported cases of self-inflicted wounds. Nervous breakdowns accounted for 10% to 40% of the disabled. Michael Tyquin rightly observes that “those who succumbed to mental illness did not have a place in the celebration of nationhood and masculinity”. They were effectively, as Larsson argues, “failed Anzacs”. The pictorial invisibility continues today with photographers’ access to Australian soldiers now completely managed by the Australian Defence Force and restricted to embedding opportunities. Some of the photographers I have interviewed condemn the control but pragmatically adapt to it because they have little choice. With the diminution of newspapers and advertising revenue, embedding with the Defence Force is an expensive enterprise. Instead, many editors source photographs from the Department of Defence’s expansive image gallery of soldiers and photo opportunities for politicians. Other photographers prefer to work unilaterally but this means they are unable to photograph Australian troops. That is a pity. We have exceptional professional photographers who are prevented from recording unregulated military service. There are great claims made about the role of war photography in developing our understanding of Australia as a nation and experience of conflict. This is predicated on an assumption that nuanced photographs are seen. We have another three years of commemoration. It might be a vain hope but perhaps we should consider photographs that expound on war and heroism rather than limiting it.